The perception of tenure insecurity as a threat to stability in a rapidly urbanising world has played a central part in the debate surrounding the question of land rights and development. As competition for secure land increases, so does the density and multitude of informal settlements which, according to UN Habitat statistics published in 2003, are estimated to house a double-fold of slum dwellers by 2030. An eccentric West African metropolis, Nouakchott today finds itself torn between prospects of an exemplary model of urban progress and the deeply rooted forces of precariousness and informality. 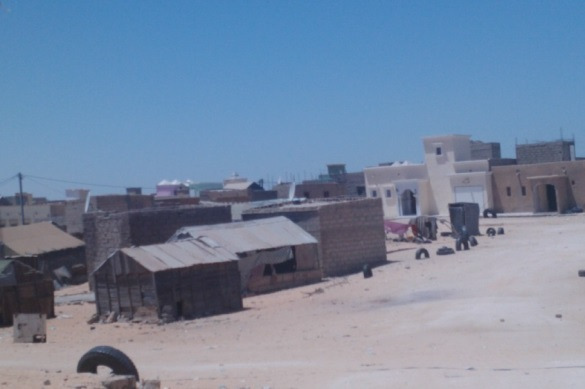 As the urgent demand for housing challenges the city’s boundaries set by the dunes, the phenomenon of the gazra, ‘invented’ by an immigrant rural population four decades ago, challenges the function of urban planning and land management institutions, undermining slum upgrading efforts and questioning the role and purpose of formalisation and regularisation in the Mauritanian context. Reflecting on findings collected as part of the « Practices of Titling in Cities in Development » research initiative – conducted within the scope of the ANR PROMETEE (Property in Muslim Transnational Environments) programme – this paper will present an overview of contemporary theoretical discourse surrounding the ‘land question’, followed by an analysis of the case study and an illustration of the contextual background. As the following pages will demonstrate, it is the unique coherence between the formal and informal, heightened by national policies, cultural and historical preconditions that allow us to discuss, identify and elaborate what tenure security means, for whom and for what it’s worth. According to the Food and Agriculture Organisation (FAO, 2002:7), land tenure can be defined as “the relationship, whether legally or customarily defined, among people, as individuals or groups, with respect to land” and as the rules invented by societies to regulate this relationship. These structures define rights to use, control, and transfer land, as well as pinpointing related obligations and restraints. While in basic terms, land tenure determines who can use what resources, for how long, and under what conditions, in broad terms, land tenure systems are subcategorised according to whether they are based on formal or informal rights. While formal property rights may be regarded as those that are explicitly acknowledged by the state and which may be protected using legal means, on the other hand, informal property rights are those that lack this official recognition and protection (FAO 2012). The UNECE (2009: 25) characterises informal settlements as “illegal residential formations, either urban or peri-urban, which lack basic infrastructure, security of tenure, adequate housing and basic services”. Varley (2013) takes this argument further by noting that rather than in-between spaces, it is easy to cement images of informal settlements as worlds apart, to bolster constructions of informality as the ‘negative’ pole of the city. She argues, however, that such interpretations rekindle the idea of a culture of poverty, and that informal settlements are in fact “in-between spaces” (Varley 2013: 14). According to Arimah (2004) the proliferation of slums and informal settlements is one of the most enduring physical manifestations of social exclusion in African cities. Based on Bolay’s (2011) account, however slums, beyond their structural instability, also provide a breeding ground for social advocacy, economic innovation and urban adaptability, thus changing into what they should be in the eyes of decision-makers: an environment to be regenerated for the benefit of inhabitants, a living space to be enhanced and a challenge to be met to promote greater urban coherence (Bolay, 2011: 10-11). Debates and critiques around land policy often focus on the neo-liberal agenda of formalising land as alienable property, most notably through land titling schemes (Jacoby and Minten 2005). In his work The Other Path, Hernando de Soto (1989) explains the importance of property rights in promoting development and prosperity; most notably, he identifies the channels through which insecure and poorly defined property rights can draw back and prevent economic development from taking place. De Soto further expands on his theory in The Mystery of Capital (2002), where he argues that the lack of titles means that the assets of the poor, which he calls ‘dead capital’ cannot be passed on, divided up, or offered as collateral for a loan. Based on this notion, De Soto emphasises how socio-economic benefits derived from increased security of tenure have the potential to lead to greater investment in individual property and neighbourhoods, as well as increasing revenue from property taxation (Woodruff, 2001:1218). Ultimately, De Soto’s idea highlights the need for the regulation of informality, which has made his theory one that is supported as well as highly criticised. As discussed by Woodruff (2001:1217), while the poor may own most of the informal assets in the developing world, the irony is that much of the land on which the informal houses are built “was in fact obtained through invasion; taken from its previous owners without compensation. Meaning; the current owners have these assets only because property rights have not been sufficiently enforced in the developing world to prevent them from being taken. Moreover, according to Lombard (2012) while land regularisation can improve access to land, housing and services, and may stimulate service provision in areas where lack of tenure is an obstacle, it does not always stimulate investment by owners. According to this argument, land titling does not guarantee access to credit or protection from eviction or expropriation, as these events can occur regardless, with the ownership of a title or without. De Soto’s work can, therefore, be viewed as providing two separate hypothetical scenarios: the first suggests that property rights impact development by altering the ability and incentives for capital formation; the second argues that land titling allows for the development of means which enable individuals and communities to secure their property rights. Based on these assumptions, we could expect that an increase in secure property rights would be associated with an increase in access to credit markets – assuming they exist (Williamson, 2010). As a geographic connector bonding the Maghreb and black Africa (Choplin 2006), Mauritania resembles a unique blend of historical and cultural characteristics which make it stand out from both West and North African identity streams. Caught in a 30-year long cycle of military rule and successive coups d’états, this vast desert nation has experienced intense waves of change since gaining independence in 1960. Inaugurated as the new capital in 1960, Nouakchott, a coastal town at the time, was to experience a massive influx of migrants from the rural areas as a response to the severe droughts of the 1970s and 1980s which destroyed the traditional nomadic way of life in the country. The most recent coup in 2008 brought General Ould Abdel Aziz, the self-dubbed ‘president of the poor’ (CRIDEM 2013) into power. The divisions between the ethnic groups, the Hasaniyya speaking Moors - divided between Bidan and Haratine communities - and Mauritanians of black African origins – the Peuls, Haalpulaar’en, Wolof, Soninke and Bambara - have structured the political landscape of this West African country since the colonial period. Moreover, the socio-economic and political exclusion and of one of these groups, the Haratine, descendants of former slaves of the Moorish community, present a conspicuous challenge calling for urgent action. A series of confrontations over resource access on both sides of the Senegal River in 1989, which escalated into violence and a major diplomatic crisis between Senegal and Mauritania, played its part in defining the current state of land rights and the mere concept of equality in tenure terms. The extension of the Nouakchott as a response to a reversed urban growth pattern marked in throughout the 1970s and 1980s, took place in a rapid and anarchic manner (Choplin 2006, 70). As the newly arrived population began to settle in, the growth of informal settlements in urban and per-urban areas of Nouakchott - other cities in Mauritania - was astounding. While the authorities attempted to contain the shifting urban trend by distributing lots to the fresh arrivals, these efforts only proved as contra-productive, most notably due to the absence of a complementary politic aimed at encompassing the former rural inhabitants in the economic fabric centred in the new capital (PDU 2012). Lacking the means to invest in their households or construct, the newly arrived populations invented a new path to accessing land; the re-sale of attributed plot and the creation of two types of spontaneous settlements: the kebbe and the gazra. Distinguishable by the tents and barracks which created it, the kebbe - a Hassaniya (Arabic dialect spoken in Mauritania) term for a slum - quickly became an expression of social and economic marginalisation in the city. Known as the first and largest slum in the city, the kebbe of El Mina (kebbe El Mina) was created on a large area of land designated for industrial development (Urbaplan, 2000) and quickly expanded beyond its improvised boundaries. The gazra, a term used to identify the illegal occupation of public or privately owned land, projects a distinct and unique expression of informality as ‘invented’ by its inhabitants. Located in the heart of same-named district, the gazra of Arafat (gazret al Arafat), covers 400 acres of land and houses over a third of the entire population of the district (ADU-URBANIS, 2008). The primary distinguishing feature of the kebbe and gazra relates to the forms of habitat in place - the kebbe is more specific in that it is a real expression of impoverished life, while the gazra is characterised by a combination of hard constructions, tents and barracks – it is the different status of the inhabitants which raises questions regarding the evidently thin line between informal habitat and ‘poverty’, as such. UN-Habitat (2009) explicitly points to planning as the way to help “fix” urban informality. The process of integrating the illegal and other habitats of the urban poor into the fabric of mainstream economy, as highlighted by Majale (2002:11), suggests “the emphasis on inclusive policies and strategies for informal economic activities, formal housing, slum upgrading and resettlement is indicative of the impending role of promotion rather than control of the informal sector in city planning.” Today, the Mauritanian government maintains a firm stand against the informal occupation of land and is determined to eliminate these trends from the facet of Mauritania’s cities. With mainstream theoretical discourse points towards de Soto as the way forward, is it accurate to claim it is, indeed ‘the best’ path for all to follow? In the first phase of national land management regulation plans, spanning from 1974 to 1988, the Mauritanian government implemented a range of policies in an effort to manage and regulate the growth of informal settlements in the capital, by distributing over 200 thousand lots to the inhabitants of Nouakchott (PDU, 2012: 20). The second phase of state-led urban planning initiatives, from 1988 to 2000, marked a continuation of the politics of land distribution, only that this time the efforts concentrated on Nouakchott. And build the capacities of the full range of urban actors, including government services, decentralized entities, and civil society. “In order to get rid of the kebbe, we had to start somewhere. So, the first thing we did was conduct a population census, construct a road cross-cutting through the slum and create a new area which would house the resettled slum dwellers. Those who were moved to this zone, called Nezaha, were attributed a plot of land and a chunk of money to cover the costs of their relocation. Today, they are settled and able to make the best of being property owners” (ADU official - Interview, 4 June 2013). “Most of the disputes we deal with relate to discrepancies surrounding the attribution of plots, usually caused by errors causing one plot to be attributed to several families, or over the definition of plot borders and neighbour disputes related to this. Initially, the conflicts are dealt with on a first-contact basis by a cadi (an islamic judge), who hears out the case and either presents a solution or calls the final verdict. However many of the cases are so complex they require much more attention. It’s very demanding and, unfortunately, not everyone’s case gets heard” (Legal advisor – Interview, 24 March 2013). Moreover, since the gazra trend (squatting trend) does not seize to exist upon the resettlement of a family and the delivery of formalised property rights, the nature of land-related conflicts in Nouakchott transcend diversity and redefines the notion of complexity: once a slum dweller is attributed a plot of land by the Administration, instead of settling, he/she either rents it out, sells it and returns to the kebbe or the gazra to squat, creating a cycle of informality in which the pursuit of an informal form of habitat weighs over the idea – and reality - of formalised property rights. With that in mind, what are we left with? The World Bank claims uncertainty of land ownership and occupancy rights “not only complicates development planning for governments, but also increases vulnerability of poor and marginalized groups” (World Bank, 2011: 3). But how relevant are these notions in an environment based on a distinct set of rules which transcend the lines dividing the formal from the informal and thereby, to a certain extent, undermining the value of formalised tenure as we know it? The ownership of land is considered a major step in improving the living conditions of slum dwellers and squatters. Wilson (2011) claims land tenure emerges as one of the means through which notions of stratification, ethnicity and gender are construed, transmitted, and possibly contested. “Before talking about the kebbe and the gazra, you have to understand the context within which this phenomenon has developed. Mauritanians, are nomadic people; the habit of moving and setting base where one decides to be at that very moment, whether it be a tent or a barrack, is part of the nomadic nature. The use of land on such a temporary basis is normal for us, and it justifies our attitude towards land and its definite ownership.” (Professor of Law – Interview, 14 April 2013). “The experience of slavery in our history cannot be dismissed. This has transcended into all parts of our society and has reflected on the unequal access to rights and resources. Until very recently, it used to be the slaves working on the land owned and profited from by their masters. Today, this situation has changed, but the tensions persist” (Professor of Law – Interview, 14 April 2013). Although security of tenure has been identified as a fundamental requirement for the “integration of the urban poor in cities” (City Alliance, 2002; 21), according to Durand-Lasserve and Payne (2012), any discussion on land tenure and property rights needs to recognise the importance of cultural, historical and political factors, as well as those of a technical and legal nature. The case of Nouakchott proves this very point. Urban growth in Mauritania has been spectacular in the past four decades. This speedy growth trend has been accompanied by the development of informal settlements, known locally as the kebbe and the gazra, which project a one-of-a-kind image of a semi-secure and quasi-legal path to land, only definable as the Nouakchottian way. The shift in efforts to regulate land rights has resulted in a process of intense politicisation of land tenure and property ownership, all in the light of a decade-long slum upgrading initiative aimed at eradicating the informal settlement from the capital, yet not succeeding in diminishing the causes of this phenomenon, deeply rooted in the nature of Mauritanian society. Although tenure security has been identified as a fundamental requirement for the integration of the poor into the urban areas and cities, based on de Soto’s approach, the centrality of land in all dimensions and urban life in Mauritania, signifies that the analysis of land tenure issues should be broadened from its traditional links in order to encompass issues such as land-use and conflict management mechanisms (ECA, 2004), as well as social, economic, political and cultural matters. Moreover, as Nouakchott’s squatters remain strong in numbers, their existence reminds us that what appears insecure to us may well be the preferred and most suitable choice for others, thereby challenging established perceptions of land rights, tenure security and informality as we see them.